On May 12th, from 12 pm to 4 pm, Kettering University’s NSBE B-Section Chapter will host its annual Family Spring Fest. This is where they take over the campus football stadium and allow children of all ages (typically 9th grade or younger) to play games, participate in obstacle courses, and enter raffles as they would at a festival. They would like our participation for volunteering with set up (10 am to 12 pm), engaging and directing youth and parents during the Spring Fest, and breakdown (4 pm to 5 pm). If you are interested in participating, please let me know as soon as possible. I would like to report the number of confirmed volunteers to the chapter by May 7th. I am open to carpooling, as well. Save the Date for NSBE44. The National Society of Black Engineers 44th Annual Convention (#NSBE44) will take place March 21-March 25, 2018 in Pittsburgh, PA. The convention demonstrates NSBE’s commitment to lead the United States in graduating 10,000 Black engineers annually by 2025. Registration for 2017 SEEK camps is now open, and the application to be a volunteer staff member is also now open. 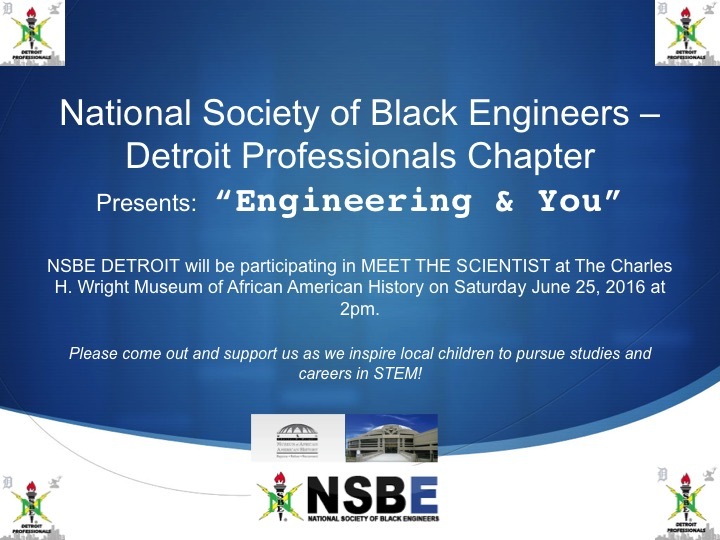 Summer Engineering Experience for Kids (SEEK) is a 3-week summer enrichment program sponsored by NSBE that exposes young children to the world of STEM (science, technology, engineering, math). See below for more information about SEEK and how you can help. 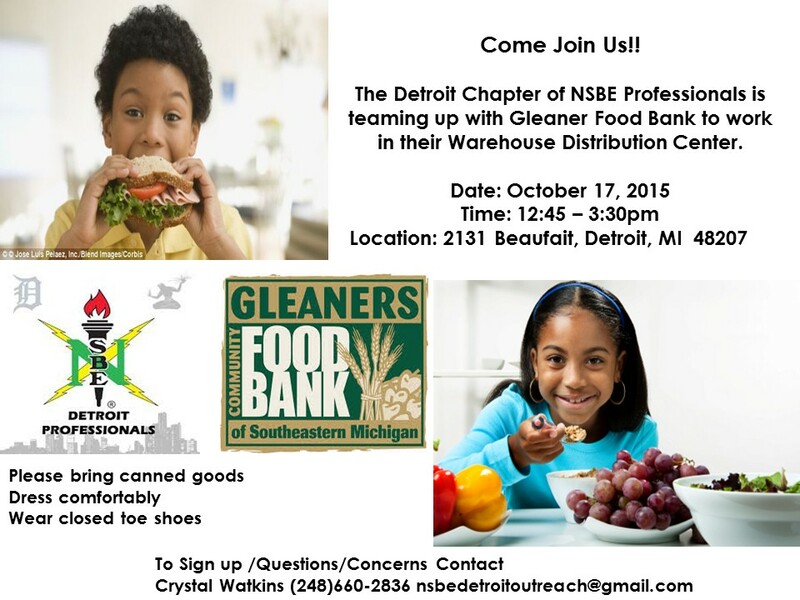 Join us on Saturday, October 17th as we volunteer at the Gleaners Food Bank We will be working in their Warehouse Distribution Center from 12:45 to 3:30 pm. Please dress comfortably, wear closed toed shoes, and bring canned goods to donate. 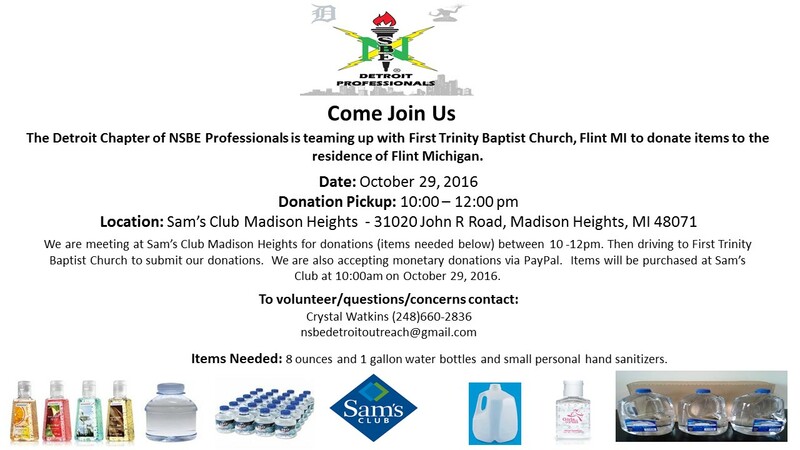 If you would like to sign up to help, or if you have any questions, contact Crystal Watkins by phone at 248-660-2836 or by email at nsbedetroitoutreach@gmail.com.